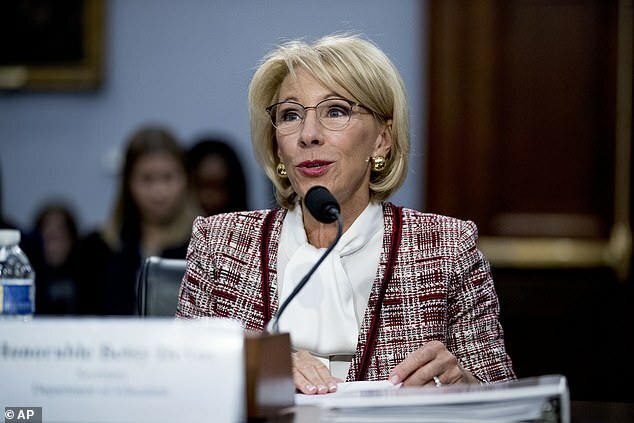 Donald Trump's Education Secretary Betsy DeVos appeared before a congressional subcommittee on Tuesday attempting to defend billions of dollars in proposed cuts to disability education programs, including all federal grants to the Special Olympics. DeVos wants to slash her department's spending by at least 10 per cent ($7 billion) in the 2020 fiscal year, including cuts to after-school programs and support for children from low-income families. She also intends to withdraw the entire $17.6 million of federal funding for the Special Olympics, the world's largest sports competition for children and adults with disabilities. That's an amount roughly equal to the taxpayer cost of five of President Donald Trump's repeated trips to his Mar-a-Lago resort club in Palm Beach, Florida. The Government Accountability Office reported in February that just four of those trips cost $13.6 million, or nearly $1 million per day. The 2017 annual report published by the Special Olympics showed $144 million of income, including $113 million from individual, corporate and foundation donors. DeVos struggled to appease furious House Democrats during an Appropriations subcommittee hearing, pointing out that previously proposed budgets had also tried to remove the Special Olympics funding. During the session, Pocan also asked the Education Secretary to state how many children would be affected if funding for the Special Olympics was removed. When DeVos admitted that she did not know, he said: 'I'll answer it for you, that's OK, no problem. Pocan then stated that the proposed budget would also reduce state grants for special education by 26 per cent, and remove millions of dollars in funding for programs to support blind children. According to Connecticut Democratic Rep. Rosa DeLauro, who chaired the subcommittee hearing, the three education budgets written by President Trump's administration have proposed the largest cuts to education funding since the department's creation in 1979. This latest budget proposal includes a $2 billion reduction for Pell Grants, along with billions more for about 30 other programs.